I was so bummed to learn that my brother was graduating basic training the same weekend I was photographing a wedding. Even though I wanted to be there for him I knew I couldn’t. I decided to book a flight from Sunday to Monday and I asked my oldest daughter to come along with me. I wasn’t exactly sure what we would do in San Antonio, Texas with so little time but I wanted to be there for my brother. When our trip ended and we were headed home I was shocked at how many things we had actually managed to do with so little time and on such a small budget! 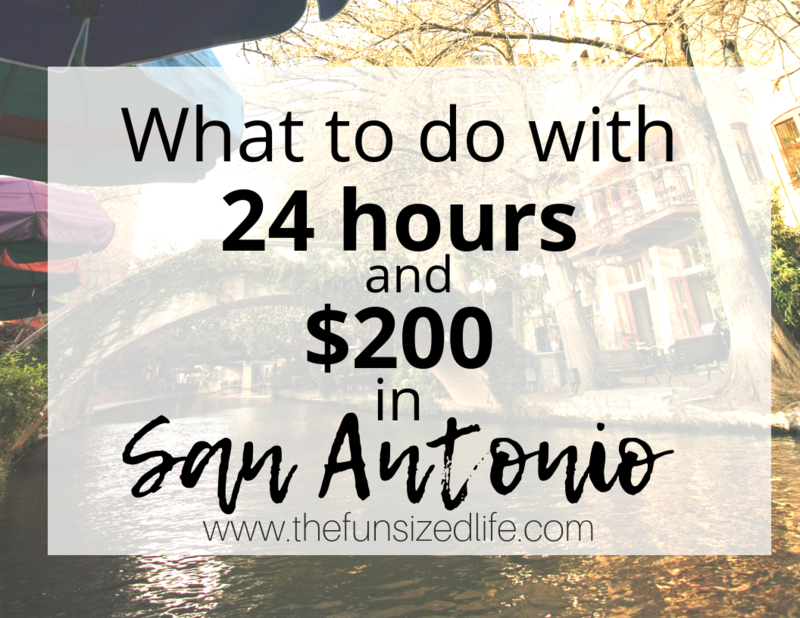 So if you are looking for a quick trip, here is exactly what you can do with 24 hours and only $200 in San Antonio, Texas! Depending on where you’ll be staying and how much traveling you will be doing, there are two best options for transportation when you are going to be exploring San Antonio. Don’t worry, I will cover all of these things! I have never rented a car completely on my own or from the airport so I was crazy nervous. Booking Buddy found me a rental car that quoted me around $50 (including insurance) and I knew that was going to end up costing me less than multiple Uber trips I would have to take. Checkout rental cars with Booking Buddy. We opted for a rental car since where we were staying was actually about 22 minutes from the airport itself. My family was also leaving San Antonio before us and only had the AirBNB until 11am. Since our plane didn’t leave until 4pm, having a rental car was a smarter decision than using an Uber and having to carry our luggage around with us for 5 hours while we explored. If you don’t plan on doing this much driving or are not old enough to get a rental car, I always strongly suggest taking advantage of Uber. Had we been staying mostly at our AirBNB and had the ability to leave our luggage there, I think Uber would have been our more cost effective choice. Sign up to be an Uber rider. We got very lucky because my family that was already in San Antonio had booked an AirBNB and let us spend the night there. Although we didn’t get to spend a ton of time in it, this AirBNB was adorable and made me seriously consider uprooting and moving to Texas right then and there. Check out some of these super affordable AirBNBs in San Antonio and use my link to get a $40 credit! La Kasita: $30 per night super charming little one bedroom home. The Jackson: $99 per night for this bright, fun Dia De Los Muertos themed home one mile from downtown! Southtown Airstream: $43 per night for some minimalist RV living at its finest! When we first started planning our trip to San Antonio, Texas, the first thing I heard about was the Riverwalk. I wasn’t sure if my family would have already gone by the time I got there and I am so glad they didn’t! The original plan was to take my daughter to the Riverwalk during the day but instead we were treated to the amazing views of the San Antonio Riverwalk at night! Restaurants and Bars – Checkout Restaurant.com for local discounts and gift cards! The Riverwalk has a bustling nightlife with tons to see and do. As you walk around, cross the bridges, and checkout all the Riverwalk has to offer you’ll also see River Boats go by. You can book River Boat tours, or just use them as a shuttle to get from place to place. They even offer special cruises throughout the year like their Holiday Cruise! Checkout this gorgeous photo of the Riverwalk at night that you can see on Visit San Antonio. When it comes to Texas tourism, one of the main attractions will always be The Alamo. This historic landmark was bravely defended in 1836. Although the battle was lost and all the men perished, no one will ever forget The Alamo. Unfortunately I missed out on taking a tour or exploring The Alamo more but, imagine my surprise when I was able to see The Alamo right from the streets near the Riverwalk. When you visit The Alamo during the day you can take a variety of tours, including, guided, audio tours and even after hours tours with a private group! At night time, you can still walk around the entrance and snap a quick photo of this huge Texas tourist attraction. Check out this other gorgeous photo from Visit San Antonio of The Alamo at sunset. After my family left early in the morning, my daughter and I had the morning and early afternoon to ourselves. Since we had already seen the River Walk and The Alamo we decided to explore parts of Downtown San Antonio that we had caught a glimpse of the night before. There are so many restaurants and shops to see downtown and the atmosphere is so open, colorful and welcoming. We had lunch at Johnny Rocket’s a restaurant that we don’t have anywhere near us in Minnesota and took advantage of eating an ice cream cone while we wandered around. Another popular site for Texas tourism that we wanted to see was the Tower of the Americas, San Antonio’s “Space Needle.” The original plan was to drive our rental car over there so that we could take the elevator up to the top. What I forgot about was the electronic scooters that were located all over downtown San Antonio! Since the Tower of the Americas was further away we decided to use the BIRD scooters instead of walk. We didn’t want to miss our flight and let’s face it, riding scooters down the street looked like a blast! Kick up your kickstand and start riding! Riding a BIRD scooter costs $1 to start and .15 cents per minute after that. That means for an hour of riding you’re looking at a grand total of $10! When we took our scooters to the Tower of the Americas we decided to keep our scooters…which meant we paid for the minutes that we weren’t riding. There weren’t many other scooters in the area and because we had a plane to catch, I didn’t want to risk not making it back in time. The Tower of the Americas is another popular place for Texas tourism. You can take an elevator all the way to the top and if you take your scooter there, you’ll avoid having to pay for parking! The cost of a ticket all the way to the top is only $13 per person and includes movies as well as use of the observation deck. Visiting the Tower of the Americas was one of my favorite parts of visiting San Antonio. With complete 360 degree views, you could see everything San Antonio has to offer. Plus, the wind blowing in allowed for some pretty fun hair blowing selfies! On our way back from the Tower of the Americas, we came across an adorable Dia De Los Muertos themed setup called La Villita. This small set of local shops and restaurants was so charming and I wish we could have spent more time there! For all of these different Texas tourism sites, including transportation and one night in the first AirBNB listed you’ll have spend a little over $100! This leaves plenty of money for food, drinks and other fun stuff! San Antonio is definitely place I recommend spending a quick trip on a budget. There is so much to see and do and all very close together. Need more Texas tourism ideas? If you are looking for more great ideas of what to do and see in Texas then you’ve got to check out this Texas Bucket List.